The hubs and I are still in Austin, a bit unexpectedly. In the wee hours of Friday morning, my stomach decided it didn't like what it had consumed only 10 hours prior, and I spent about six hours going back and forth between the bed and the bathroom. So we decided to leave this morning, only to have the hubs wake up with the same stomach virus! Now here we are, waiting out the bugs at my overly generous in-laws' house (while my overly generous parents continue to watch their grand-dog), hoping to be on the road tomorrow. All this down time has led to a lot of clicking around on Pinterest, so I thought I'd resurrect the How Very Pinteresting segment to share what I've been drawn to the past week or so. Love this idea for a simple, modern holiday centerpiece. A great way to reuse some old wood and a strip of fabric. 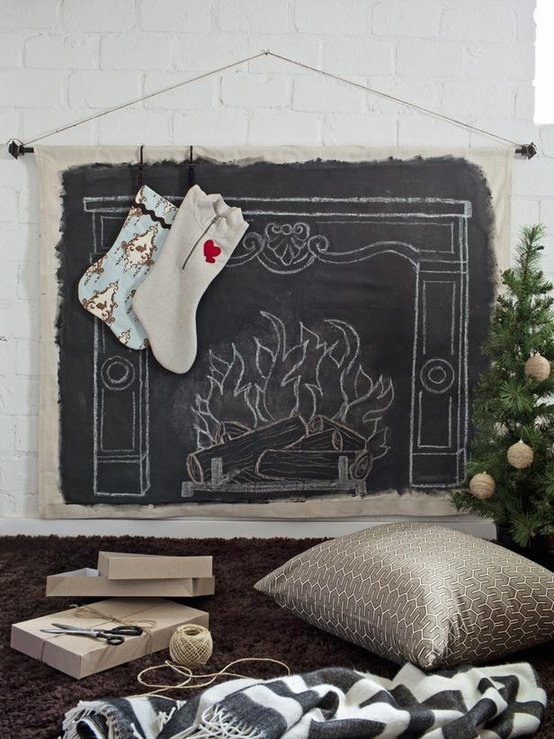 If you don't have a fireplace, never fear! You can hang stocking from this one (pictured above). You could almost seeing yourself skiing down this cake. We made a similar Christmas tree our first year of married life. It was free to DIY! I have the perfect screen in my garage for this holiday decor. Now to find the vintage ornaments! Dear Santa: Please put one of these in my stocking! This dish has fried garlic...nuff said. Love these golden magnets...no butts about it. So gooey, these brownies have to be good. Let's get lace-y for this year's holiday party.